I’ve been told to look into the magnitude of changes in the market. I’ve done that while sorting them into 2 categories; by the accuracy of the directional prediction. 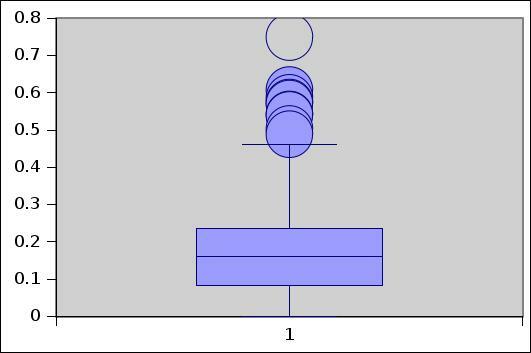 The following box-plots show the results. You will see that there are outliers for both groups, but the number of outliers for the wrong-prediction group are greater in number. This might be why using a straight enter-and-exit strategy will not work; the losing trades lose a lot. I should look into placing a hard stop-loss at the 0.3 mark. 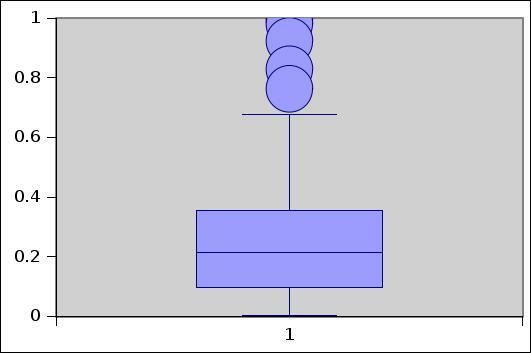 To clarify, the magnitudes shown in these box-plots are not the number of pips that are gained or lost. They are normalized values, where 1 coincides with the greatest movement seen in the training-set of data. Maybe I should look that them in terms of actual pips, but that shouldn’t make any difference to the chart. On second thought, I should look at the pip-values of the change, if only to be thorough. Better safe than sorry. I’ll put that up in a later blog-post. Edit: The 0.3 mark corresponds to a 0.0187 change in the forex-rate, approximately 187 pips. So I should place a hard stop-loss 187 pips away from my entry point. I will look into the performance of a trading system that uses this.